Our Strategic Plan for a Sustainable Future 2018 – 2023 sets out our ambitions for the years ahead and gives us a route map for planning our projects and services. 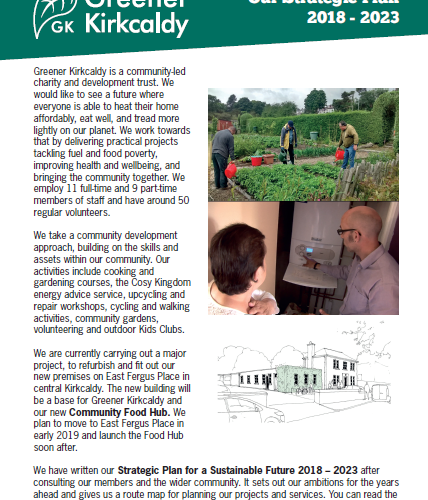 It aims to create a financially sustainable future for Greener Kirkcaldy so we can meet the needs and aspirations of our community. We developed it after consulting with our members and the wider community. We started the conversation with a workshop at our Annual Gathering in May 2017 where we asked people what they wanted to see happening in the community, and carried out a community survey that was completed by 385 people. We then wrote a draft plan, held a follow-up event in March 2018 to get community feedback, and finalised the plan based on the comments we got. You can read a summary version (4 pages) or the full version (28 pages) here. Both files are in PDF format. If you have any questions or feedback about the plan please get in touch.